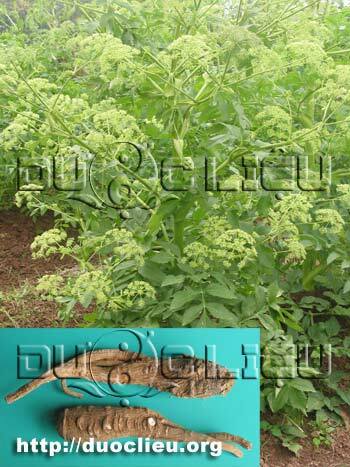 Dahurian angelica root (Baizhi)-Angelica dahurica (Fisch. ex Hoffm.) Benth. et Hook. f.
Part Used & Method for Pharmaceutical Preparations: The root is dug in the period between summer and autumn, when the leaves turn yellow. The fibrous roots are removed, dried, soaked in water and cut into slices. 1. Wind-cold exterior syndrome manifested by headache, supraobital pain and nasal obstruction. Dahurian angelica root (Baizhi) is used with Chinese green onion (Congbai), Prepared soybean (Douchi) and Fresh ginger (Shengjiang). 2. Thick and sticky nasal discharge (as in thinitis, nasosinusitis). Dahurian angelica root (Baizhi) is used with Xanthium fruit (Cang'erzi) and Magnolia flower (Xinyi) in the formula Cang'er San. 3. Boils, carbuncles, ulceration and skin diseases. Dahurian angelica root (Baizhi) is used with Trichosanthes fruit (Gualou), Tendrilled fritillary bulb (Chuanbeimu) and Dandelion herb (Pugongying). 4. Damp-cold type of leukorrhea manifested as watery, whitish and profuse leukorrhea with no offensive smell. Dahurian angelica root (Baizhi) is used with White atractylodes (Baizhu), Cuttlefish bone (Wuzeigu) and Poria (Fuling). 5. Damp-heat type of leukorrhea manifested by thick, yellow and profuse leukorrhea with offensive smell. Dahurian angelica root (Baizhi) is used with Phellodendron bark (Huangbai), Plantain seed (Cheqianzi) and Flavescent sophora root (Kushen). Cautions & Contraindications: This herb is contraindicated in yin deficiency.